If this electric car had caught on in 1932, our roadways would have looked very different. 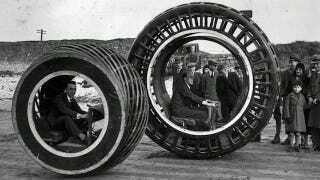 Instead of little boxes sitting on four wheels, the roads might have been filled with giant hamster wheels that rolled over us as we drove. The Dynosphere (sometimes spelled Dynasphere) was invented in 1932 by JH Purves. Some of the Dynosphere models ran on gas, but the single-person model was electric. Purves claimed that a single model offered greater fuel economy, but even if that was true, the 1000-pound Dynosphere wasn't exactly a practical device. For one thing, the cage design would have made navigation difficult, and it looks like it would be particularly uncomfortable to drive in the rain. On top of that, turning the Dynosphere was not for the faint of heart — you had to lean your body out of the machine and pray it wouldn't tip over. So the Dynosphere was relegated to the trashbin of history, leaving behind only photos of the prototypes. It did, however, anticipate one innovation: South Park's "It" vehicle.